Leo's Oscar speech and reading more about Valentina has really made me think more about the world we are living in and its current situation. With the economy cooled and the planet heating up (global warming is real you guys! ), everyone needs to do their bit when it comes to cutting down on waste and making the fullest of what we have. With that in mind, I was more pleased to hear from Valentina and find out more about their beautiful jewellery designs. 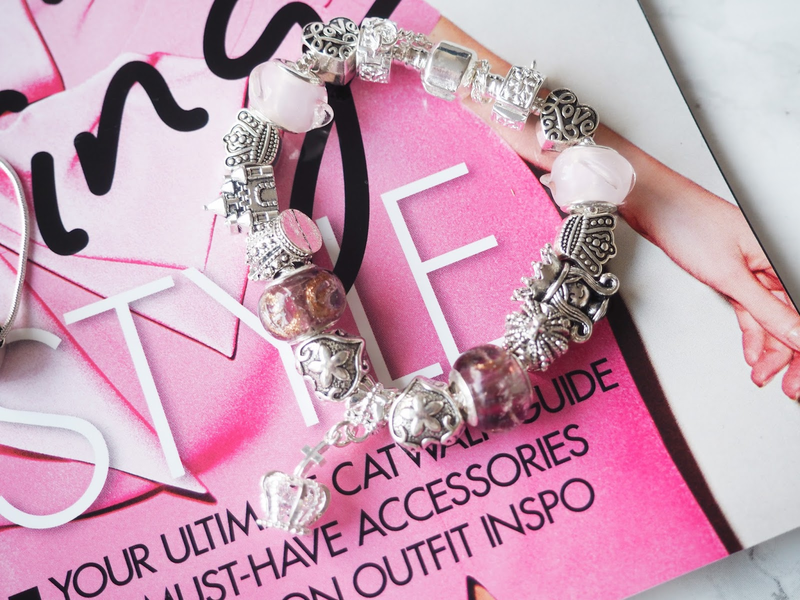 Spoilt for choice, I went for the Princess Bracelet* which contains a silver plated alloy chain, silver-tone alloy charms and lampwork glass with sterling silver inserts beads, aka many gorgeous things making up for a great looking bracelet that is girly, feminine and just plain cute. Each bead is stunningly crafted and together they create a trendy bracelet that is bound to match all of my spring/summer looks. I went for something more pinky because rose quartz is trendy as! Additionally, a portion of all proceeds from this bracelet are donated to Fauna & Flora International, a charity working to secure a healthy future for people, wildlife and wild places. Apart from ready-made bracelets, Valentina also offers a range of style packs to enable us to build any themed bracelets or to fashion custom designs. With this in mind, I put together my own Cuff* and Necklace* as well, and I love how they came out. If these aren't pretty enough, Valentina's aim is to address the need for sustainable jewellery and fashion accessories with beautiful, customisable and 100% nickel-free jewellery which will not only last a very long time but also is sustainable, fully recyclable and allows you to do more with less. Additionally, they donate at least 10% of all proceeds to charity, so not only are you purchasing a bracelet for life you are also helping a good cause. They also share these charities aims and try to support their goals through their own business practices; all packaging is fully recycled and 100% bio-degradable (even the bubble-wrap)! With bracelets starting at only £33.99, you will not be breaking the bank! I don't know about you, but I am all up for helping a good cause, and if you are too this would surely make a great Mother’s Day gift or a simply a treat for yourself. What are your thoughts on sustainable jewellery? Let me know below! Thanks for reading beauties and have a nice day ahead! Absolutely love the jewelry pieces, thanks for sharing! Awesome and I love the concept. Check out our latest collaboration with artist Jeremy Martin. I rather this than the overhyped, overpriced Pandora and knowing that this company supports a good cause and also environmentally friendly makes me more determine to support them. 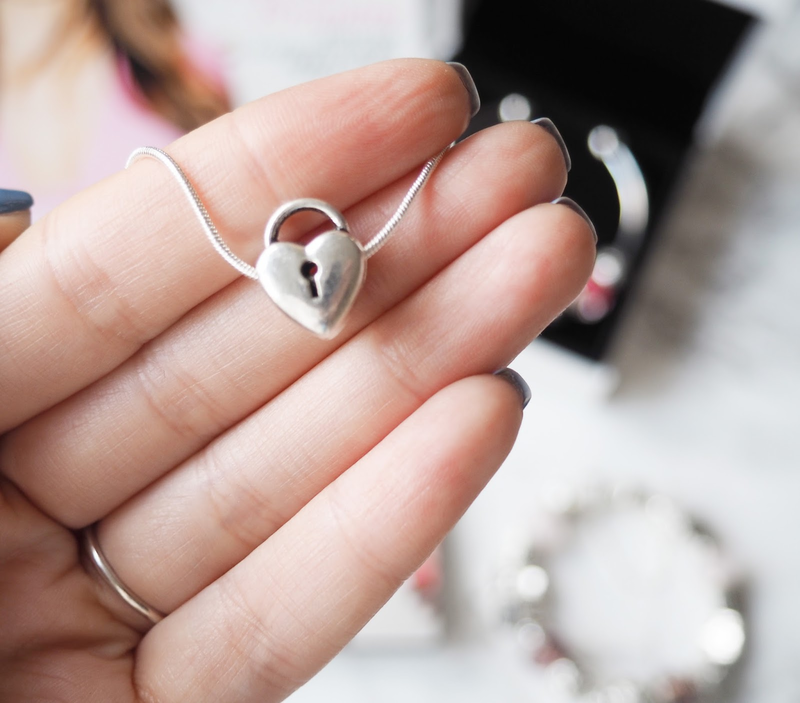 love the little heart neckless!! so cute! Very cute pieces, absolutely adorable. These are so beautiful, I love the charm bracelets. The jewellery is so so pretty! Love this Princess bracelet, it's beautiful and it's great that they donate portion of their profits for ecological charity. Really gorgeous jewelry! What better than shopping and actually supporting a good cause? These look lovely and the premise behind them is great too! Definitely would make a great Mother's Day present! Love these bracelets! They are gorgeous! Beautiful jewellery! I like the cuff the most. Beautiful jewelry and I love the concept. Happy Thursday, Pam. Very beautiful pieces, I would wear these any day. Adorei o conceito e as pulseiras são lindíssimas! Principalmente a "Princess". Those are really lovely charms! Sustainable jewelry is something new to me, but I agree that it's very important to care about the planet and our environment! Enjoy your weekend honey! Gorgeous. I love the themed bracelets. Silver is the best sustainable jewelery. I love these bracelets. I feel like I need to treat myself with these. I love it! They're so beautiful! Que fotos lindaaaas! Amei o pingente do coração. You know what? One of the things that worries me the most in this world is exactly the fact that there are so many people who need, basically anything, more than us. And there are so many people who spend their life’s complaining when there are people out there who have it so much worse and yet are so much happier than them. Than us too. I love things, posts, like this. They show me that there are still good people out there – give me a bit of more faith on humanity. I understand how smitten you are with Valentina and her pieces – they’re breath takingly beautiful and I know I’m going to get my hands on them as soon as possible. If I had to pick a favourite I’d definitely say the cuff has got me hooked. That bracelet is so cute, I have one similar from Pandora and I love it!! Today jewellery is loved by almost all women and they wish to own a large, unique collection of their desired jewellery. For each gold ring produced, 20 to 60 tonnes of earth is displaced," Coelho said. "Of that tremendous quantity, one tonne of ore is extracted for that one ring. To leach out the gold from the ore toxic chemicals inclusive of cyanide, mercury, and arsenic are used. we are speakme about untold quantities of poisonous waste for one vivid bauble," Coelho stated.